This week’s contributing bloggers are Melissa Levin and Alex Fialho. Levin joined Lower Manhattan Cultural Council (LMCC) in 2005 and is currently the Director of Cultural Programs, overseeing Artist Residencies, River To River, Open Studios, and Exhibitions & Installations in the Arts Center at Governors Island. Fialho is an arts writer and curator. Alex has been LMCC‘s Curatorial & Research Associate since 2014, and also works as Programs Manager at Visual AIDS and is a regular contributor for Artforum. Lower Manhattan Cultural Council’s 2016 summer exhibition is dedicated to the late artist Michael Richards (1963-2001) and includes a range of Richards’ work in sculpture and drawing, most of which has not been on public view for over 15 years, as well as documentation and ephemera of his art and life. On the morning of September 11, 2001, Richards was working in his LMCC World Views studio on the 92nd floor of World Trade Center, Tower One, when the first plane struck, taking his life along with the thousands of others who passed away in the tragic events of that day. At the time of his passing, Richards was an emerging artist whose incisive aesthetic—always provocative, at times playful, yet never without a critical bent—held immense promise to make him a leading figure in contemporary art. Michael Richards: Winged will be the largest exhibition of Richards’ work to date and will show the breadth of Richards’ extensive practice. In the course of putting this exhibition together, LMCC worked closely with The Michael Richards Estate to conserve and reconstruct 8 sculptures; we discovered drawings in multiple private collections and in the collection of the Pérez Art Museum Miami; and we spoke with more than 50 close friends and colleagues of Michael’s to learn and understand as much as we possibly could about his art and his life. Michael surrounded himself with a beautiful community of people in New York City and beyond. His friends shared memories of Michael’s resolve, his generosity, his smile, and his commitment to his practice. We also happily discovered Michael’s own words, about art-making and specific works, in interviews and artist statements that are woven into the exhibition text throughout the gallery. Materially and conceptually, Richards used the language of metaphor to investigate racial inequity and the tension between assimilation and exclusion in his art. Aviation, flight, and escape were central themes of Richards’ work, gesturing towards both repression and reprieve from social injustices, and the simultaneous possibilities of uplift and downfall, often in the context of the historical and ongoing oppression of black people. Significant points of reference for Richards included the Tuskegee Airmen, the first African-American pilots in United States military history, and the complexity of their triumphs in the face of segregation, as well as religious and ritual figures and stories from African and Judeo-Christian traditions. Centering his own experience, Richards used his body to cast the figures for his sculptures, which often appear as pilots, saints, or both. The many layers of Richards’ individual works continue to be both powerful and disarmingly relevant. Metaphors and imagery repeat and iterate, opening onto a range of responses to the complex inquiries Richards was making, and the poetic practice that results. For example, Winged (1999) – the namesake of the exhibition – distills many of the central themes of Richards’ practice. Conjoined at the elbow, the cast forearms are pierced with feathers, bringing together human anatomy and bird-like features to evocative effect. 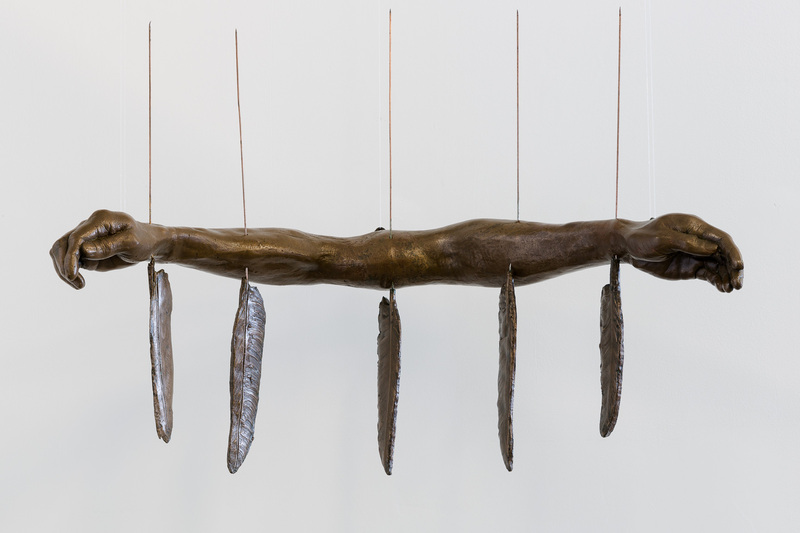 Despite its weighted bronze, as it hangs from the ceiling, Winged maintains a lightness as if it is floating. The work exemplifies the double meaning of the word winged, which either describes flight or an object’s extra part or appendage. The work also calls to mind the Greek myth of Icarus, who flew too close to the sun with wax feathers that melted, causing him to fall to his death in the sea. In this work and others, Richards explores the opposing forces of uplift and downfall inherent in flight: the ascendant potential of wings and the risk of crashing downwards. Vertigo — the overwhelming sensation of dizzying spinning — is felt most often when peering downwards from great heights. 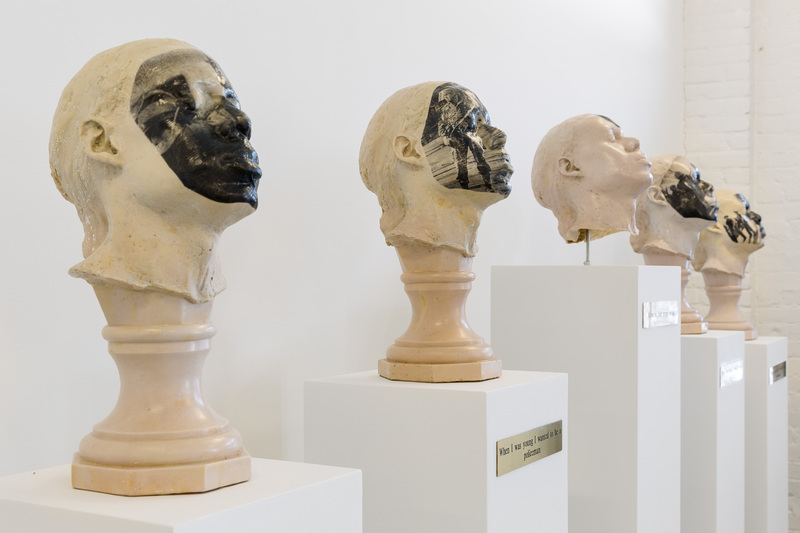 The narrative of Richards’ sculpture reads as one in which a loss of faith in the police department and its relationship to safety and protection, implied through the antagonistic stance of the images of police, has an effect of disorientation. During our contemporary moment, in the face of recurring police brutality, the continued murders of black men at the hands of white male police officers, and the responsive Black Lives Matter movement, A Loss of Faith Brings Vertigo continues to have pressing resonance two decades after its creation. Richards’ best-known work is Tar Baby vs. St. Sebastian (1999). 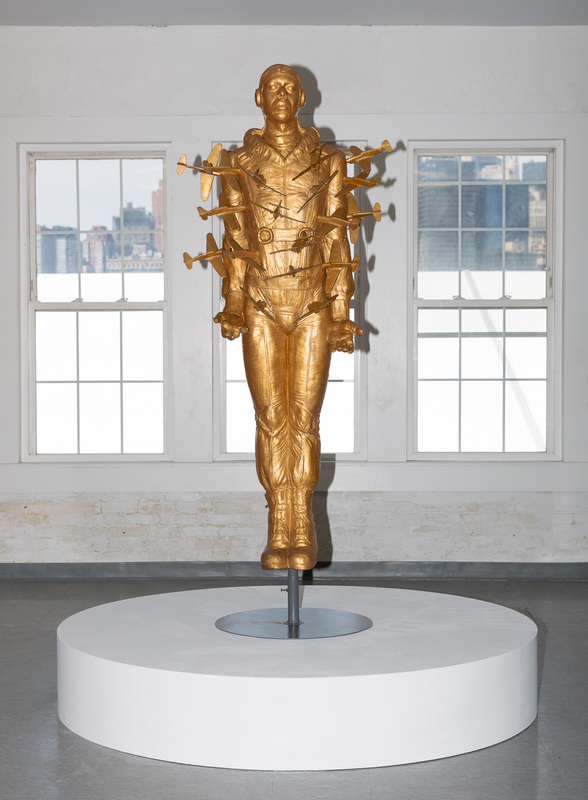 For the sculpture, Richards cast his own body, outfitted the sculpture in the uniform of a Tuskegee Airman, pierced the torso with 18 small airplanes, and painted the figure gold. The title of the piece conflates two well-known narratives of struggle. Tar Baby is a fictional character in Joel Chandler Harris’ 1881 Uncle Remus story, in which Br’er Fox makes a doll out of tar and turpentine to ensnare his rival Br’er Rabbit; the more that Br’er Rabbit fights to get loose of the Tar Baby, the more entrapped he becomes. In contemporary usage, the term has taken on the valence of a derogatory term or slur used to describe a black person. Richards perhaps refers to this folklore to point to contemporary America’s deep entanglement with racial inequity. Saint Sebastian (256–287 AD) was an early Christian saint and martyr. At a time when it was punishable by death to be Christian, Saint Sebastian was bound to a stake as a live archery target, with archers firing arrows at him. Representations of Saint Sebastian depict the figure in ecstatic agony with multiple arrows puncturing his skin. He is now known as the patron saint of soldiers, athletes, and those who desire a saintly death. The eighteen planes that puncture Tar Baby vs. St. Sebastian place the Tuskegee Airmen in dialogue with this biblical story of martyrdom. Richards was a significant voice that we feel compelled and privileged to amplify. It is our hope that shining this light on his powerful body of work will re-open a conversation about the artist himself, the issues, concerns, and questions he raised in his work, and the profound ways in which he raised and responded to those inquiries. Michael Rolando Richards was born in 1963 in Brooklyn, New York. Raised in Kingston, Jamaica, Richards moved back to the United States to attend Queens College, where he earned a BA in 1985. He received an MA from New York University in 1991, and attended the Whitney Independent Study Program from 1992–93. During his career, Richards held esteemed residencies with Lower Manhattan Cultural Council (2001); National Foundation for Advancement in the Arts with ArtCenter/South Florida (1997–2000); Socrates Sculpture Park (1997); The Studio Museum in Harlem (1995–96); and Marie Walsh Foundation (1994–95), among others. In 1995, he was the recipient of an Art Matters Individual Artist Grant. Richards had a solo exhibition at The Corcoran Gallery of Art in 2000, and was featured in two-person and group exhibitions including Passages: Contemporary Art in Transition at The Studio Museum in Harlem, NY, Chicago Cultural Center, IL, and Miami Art Museum, FL (2000); Postcards from Black America at Debeyard Museum, Amsterdam, The Netherlands (1998); Michael Richards and Cathleen Lewis: Recent Works at Bronx Museum of the Arts, Bronx, NY (1997); No Doubt: African-American Artists of the ‘90s at The Aldrich Museum of Contemporary Art, Ridgefield, CT (1996); and Choice Histories with REPOhistory at Artists Space, NY (1992). His work is held in the collections of institutions including The Studio Museum in Harlem, NY; the Brooklyn Museum, NY; and the Pérez Art Museum Miami, FL. Franconia Sculpture Park, near Minneapolis, MN, is home to a permanent memorial to Michael Richards, Are You Down?, a bronze recast of an original, large-scale sculpture by Richards, created during a Fellowship there in 2000.